A Tonk's Tail... err, Tale...: Revenge is a dish best served on facebook. Revenge is a dish best served on facebook. 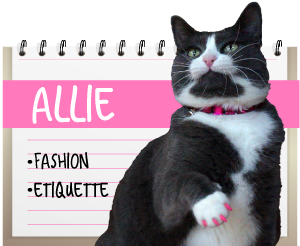 Allie: Which kitty has the hacking skills in this family? 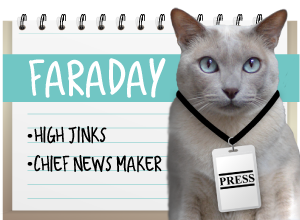 Faraday: ALLIE! STAY OFF MY ACCOUNT! Allie: I'd remember this, next time you want to trap me on the Superhighway. 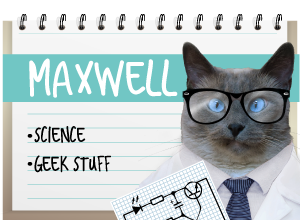 Next time, I might tell them about how you nursed on Maxwell when you were a kitten. Hehehe! Sweet revenge!!! I fear this is NOT the end of it!! Ha ha Allie sweet revenge. Have a serene Sunday and enjoy some big easy today. Awww :) u funny. Hee hee! 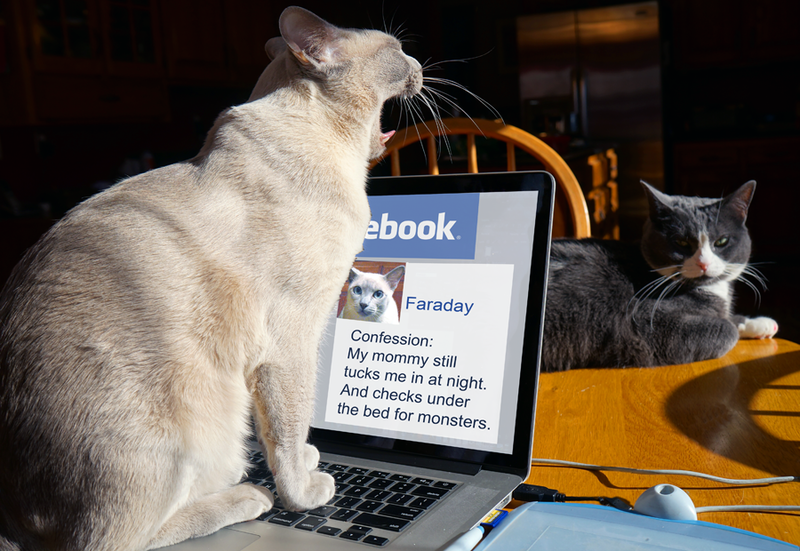 You better change your password, Faraday. 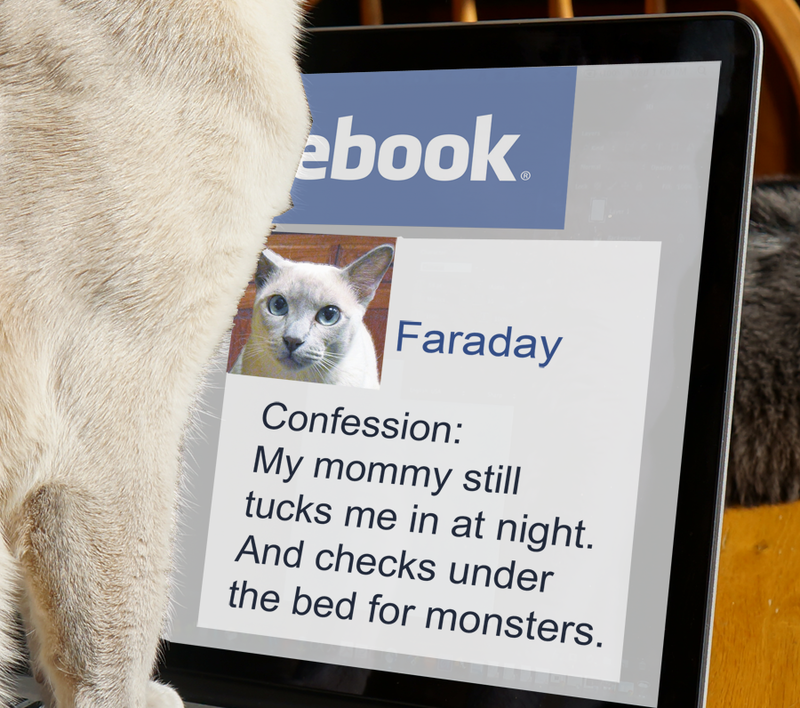 Faraday, always lock the computer before you walk away to use the litterbox. Just sayin'. Me is rolling onthe floor!!!! Mes just LOVES it when coffee comes out Mommy's Nose! Hahaha! We have a strong feeling Allie isn't near being done with her revenge! Faraday, don't mess with us girlcats. Just sayin'. Don't let her get to you, Faraday! I nursed on Tommy when I was little! So what? Yep, my Tonkinese is the same way. He's almost 11 years old and been that way from the beginning. It's ok Faraday, your mommy wouldn't want you any other way. Carefully Allie, what causes the other kitties to point and laugh also makes him sure popular with the human ladies. Faraday may need his own fan club soon! Ours is just swooning! Bwahaha! You had that coming Faraday. Ha ha! Theese one is a good one! Allie you are so clever! Hahaha. You know what's more scary than an evil cat... and evil smart female cat. Monday Medical: Can your cat get the stomach flu? Funny but No: Romantic times!